We knew the cheapest Michelin star meal opened in Melbourne Hawker Chan so we had to try both to compare! 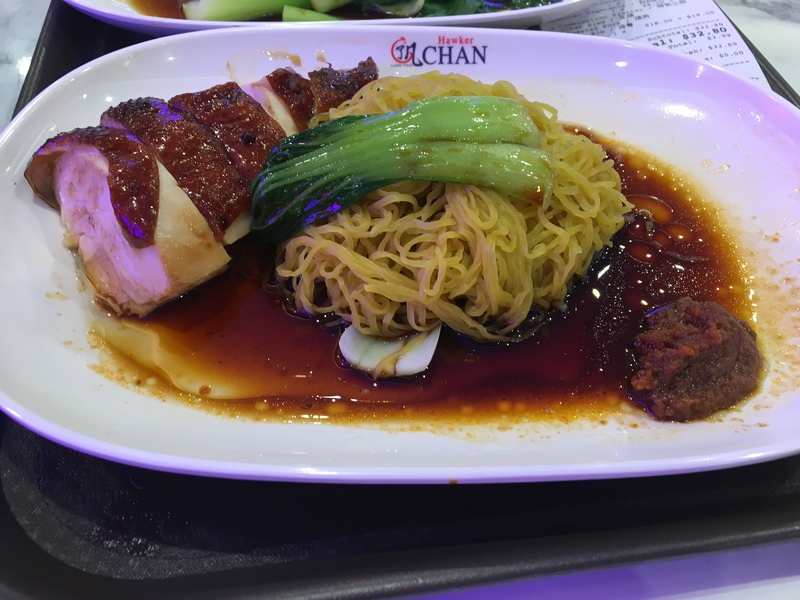 Went to Hawker Chan in Singapore- Chinatown first, it was in late December and we were delighted to have $4.80 SGD soya chicken and noodles. It was the softest/tender chicken we had. The soy noodles tended towards the sweeter end of soya sauce. But very nice with the noodles! We had the egg noodles and also the hor fun. Added an egg for less than $1 for each dish – that was tasty. Hor fun was indifferent, I would recommend the egg noodles. The line was hardly anything – maybe because it’s well established, and the hype is gone. But it was still very busy at 7pm! And by 7pm, their roast pork were sold out! If you do go to Singapore Hawker Chan go there early! They close early 😦 We wanted to visit the second time before we left Singapore, but missed it. For Melbourne. At the initial phases of launch, I heard about 45 minute wait to get inside, then another 45 minute wait to order! So i hadn’t attempted lining up until recently. We entered on a Friday at 5.30PM, and there was no line! I couldn’t believe it. Recommend going at the early dinner time. Soya Sauce Chicken Egg Noodle is $8.60AUD. The soya sauce tasted different to the Singapore soya sauce. It was more sweet than expected. The chicken was quite thick at the breast part, so the sauce couldn’t be infused in the meat. Other areas of the chicken were good. They also add sambal sauce on the side, maybe that was what I needed to mix to balance out the sweet soya sauce? The egg noodles with the sauce was lovely. I enjoyed it. The 3 combination platter $18.00AUD had ribs, roast pork and bbq pork. Ribs was a bit dry, but really nice in flavour. If only it wasn’t over-cooked! Roast pork and bbq pork were good. We also ordered the seasonal vegetable – $6.00, but I didn’t think it was worth it, the dish was small suitable for a snack, but the veggies are easy to make with the soya sauce dressed on top, sprinkled with fried garlic. The Verdict: Singapore Hawker Chan! Now that I compare both photos, the egg noodles in Singapore looks thinner than Melbourne’s version. Also, I find that the chicken in Singapore is smaller than Melbourne. hence the tenderness and more juicy. Chilli sauce is a separate condiment in Singapore and is mainly the chilli sauce you get for hainanese chicken. Melbourne has Sambal.